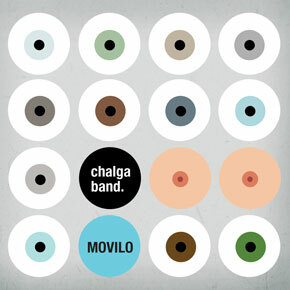 Movilo is a new production by Chalga Band, released by Notti Ludi in 2012. This is a wiser reading of the Balkan cookbook – besides the usual shopska salad and mixed grill, here you can also find some new, exotic recipes with spices coming from Persia to Argentina. Generously washed down with that universal medicine for all the soul’s ills – 80-proof grape rakia. The album contains 12 audio tracks, one video, a photo gallery and song texts originally written in the Romani language and translated into English, and, especially for our numerous fans in Italy – into Italian as well. In fact, Chalga Band has cooked up a musical adventure for us. Ventsi Grozdanov’s inviting accordion imperceptibly delivers us into the sax and clarinet virtuoso Marin Marinov’s hands, whose solos and improvisation keep our feet a good meter off the ground – only to be “slammed” with Ventsi Radev maelstrom of rhythms – drums, darbukas and tupans. The first surprise comes with the title track “Movilo,” which kicks off the disk. This is a song written by the Argentine musician and composer Miguel Di Genova for his electro-tango group Otros Aires, which he has kindly made available to Chalga Band. And now we see it before us in new clothes – dressed in the spirit of Balkan Gypsy music – which goes to show that in this world, distance doesn’t mean anything anymore. The Romani lyrics were written by the young Roma singer Petar Yankov, inspired by a new, passionate love (Movilo means “my soul” – what else?). The next song again skips across borders – “Storia d’Amore”(“A Love Story”), once sung by the great Italian Adriano Celentano, here performed by the charming guest vocalist Tonino Carotone from Spain and spiced up in Sofia. This track sounds as if Tonino and Chalga Band have been playing together forever – is there anything grape rakia can’t do?! And when the singer yells “rakia-a-a-a-a” at the end of the song, he definitely knows what he wants. From there on out, fasten your seatbelts! Or rather, ditch your clothes and jump up there with the dancing girls – at Sofia night clubs they’ll even hop up on your table – so forget about your boss and your shrinking paycheck! We take a breath of fresh air in the company of another interesting guest – Yalda, a singer from Iran – Ancient Persia. Her rich voice on “Bir Sana Bir De Bana” and “Yambo Sana” reminds us of dark, mystical nights, sandstorms, and fairytale treasures. Guitar, saz and kaval – instruments from different ethnic groups – make us forget where we are, each one tugging at our attention in its own way. And when the final chord dies away, we’re left wanting more and more. The sorcerers from Chalga Band once again whisk us across the ocean, this time with “New York Kyuchek,” on the wings of Marin’s clarinet. Phrases from jazz clubs, Gypsy trills and improvisations whose origins only he knows run wild, chased by the guitar’s rhythm. Where you’ll land after – that is up to you. Movilo is a designer product, inspired by Paolo Guilini’s ever-seeking, inexhaustible spirit, formatted and elegantly balanced by Boyko Petkov in his recording studio. A warm, living and fresh counterpoint to this crazed electronic world.